It never paid so well to be a patriot! Click here to play! This progressive jackpot slots machine is just begging to be won, so hoist Old Glory and play for your chance to win almost a million dollars! 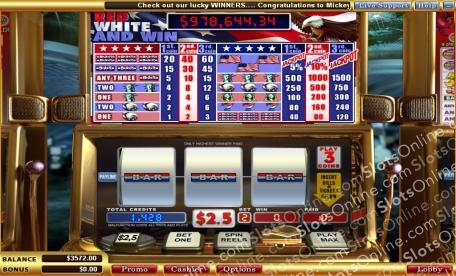 Red White and Win can only be played with real money, but it's one of the easiest slots games to play. The bet is set at $2.50 which is a small price to pay if you manage to get three American Flag symbols in one go; that sort of spin will win you the entire jackpot when played on the 3 coin multiplier. But the jackpot isn't the only thing you have to look forward to! There are 39 different payouts on Red White and Win spins, so there is certainly a lot to play for, and even more to take home. What better way to celebrate our great country than to play the most patriotic of all progressive jackpots, Red White and Win! With almost a million dollars up for grabs, what are you waiting for?